I stated quite clearly in April my belief that Boris Johnson's commitment to the London Cycling Campaign's Go Dutch principles was not sincere. However Johnson won the election fair and square, so the LCC needed to take him on his word, and just keep monitoring the situation and reminding him of his commitment in every possible way. He had a bit of a breathing space over the Olympic period, when one would have expected less focus on such long-term issues as safe streets, but that's well behind us now. The good news is that the mayor has made one big pledge along the path to meeting his promises to Go Dutch, namely identifying the locations of his first two flagship schemes. He also appears to have set the ball rolling for TfL to move towards adopting international cycling best-practice for Superhighways and other streets. The not-so-good news is that we still don’t have a plan, and with developments on London’s roads continuing to show little sign that the mayor’s promises have taken root, our optimism remains guarded. True we are still only a few months into the Mayor’s four-year term, and much of that time he has been focusing on the Olympics and the Paralympics, which is a massive PR opportunity for him and the city. But by now he should have done more to convince Londoners that he has given the backing to TfL that it needs to press full steam ahead with measures to make London as safe and inviting for cycling as it is in Holland. The verdict? Boris has been saying enough of the right words to get a pass mark at 100 days, but nothing tangible has actually changed yet. It's now six months after the election, and there's still no real plan to put the Go Dutch commitment into action in any way, shape or form. As Cycalogical has noted, the review of 100 junctions to make them safer for cycling, the most concrete commitment on cycling to come out of this administration, seems to be running into the usual buffers of outdated, poor, unimaginative thinking at TfL, with its blocking obsession with maintaining peak traffic capacity at all costs. At the fascinating Love London, Go Dutch conference in Westminster on 18 October, sponsored by the Dutch Embassy and Royal HaskoningDHV, it was proved quite conclusively how one of the highest-profile junctions under review, the Lambeth Bridge northern roundabout, could indeed be rebuilt to a Dutch pattern, in the space available, and within the requirements of UK regulations. But TfL's actual proposals fall massively short of this. They go for the classic, permanently-failing, UK "two track" approach to cycling, splitting cyclists up into the "confident" ones who are expected to joust with motor vehicles on the carriageway, and "novice" ones who are believed to be happy with rubbishy shared pavements, long ways round and no priority. My concerns about the current design centre around providing two sub-optimal options, rather than one better option. Cyclists using the road will have less space than at present, due to the carriageway narrowing, potentially increasing conflict. (Motorists may also expect them to use the pavement). However, cyclists using the pavement facility may (a) have trouble leaving the road at a sharp angle, (b) then come into conflict with pedestrians, and (c) experience problems crossing using the zebras, including conflict with motor vehicles. 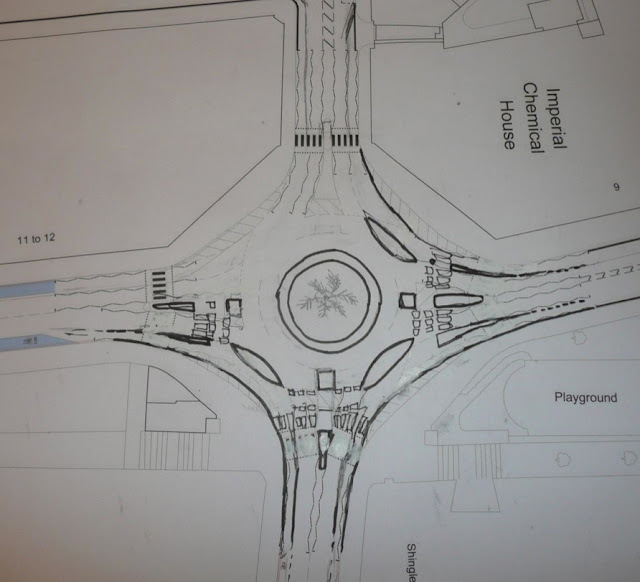 At the Waterloo IMAX roundabout, another well-known blackspot, the junction review has produced "interim proposals" (why are they bothering with these – why not do it right once?) that amount to slight changes of kerb geometry and a fair amount of green paint on the road, in one place producing a cycle lane between a straight ahead vehicle lane and a left-turn vehicle lane, all completely unprotected of course. Those who know this traffic maelstrom will appreciate how inadequate all this is. 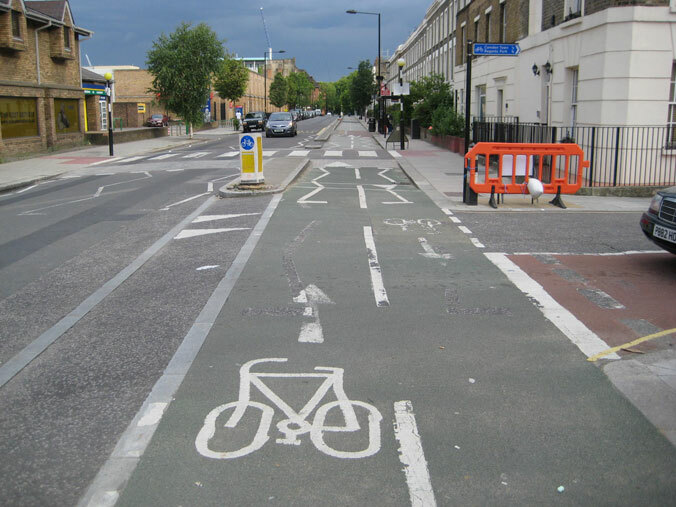 (My friend Paul Gannon, ex of Camden cycling Campaign, always used to say "The faith that UK traffic engineers place in paint is truly touching"). It's more or less as far from a Dutch roundabout solution for motor traffic and cyclists as it could possibly be. On another recent consultation, on the A24 in Morden, As Easy As Riding a Bike notes the same stalwart commitment of TfL to absymal quality solutions, a chaotic mixture of shared pavements and intermittent, interrupted, narrow, unprotected on-road lanes, on a road where there is manifestly space to provide a high-quality protected cycle track for a long distance. On to other subjects, and the Mayor still has not told us clearly where or what the three flagship Go Dutch schemes that were part of the election commitment will be. He has not made good his promise to appoint a cycling "czar" or commissioner, and we have no idea what powers or influence such a figure would have, when appointed. He has spoken of some sort of new cycle link across central London to join the dangling ends of the Superhighways, which appears, from a limited press report, as if it will use the Embankment. It's being called a "super-corridor". Now, every time Boris or TfL use the word "super" to describe anything to do with cycling infrastructure, my heart sinks. Because we know, we know, from experience, that the use of that adjective indicates the triumph of PR spin over engineering competence. And the word "corridor" is a discredited one in UK cycling policy. It tends to indicate a bodge-up, as in Edinburgh. 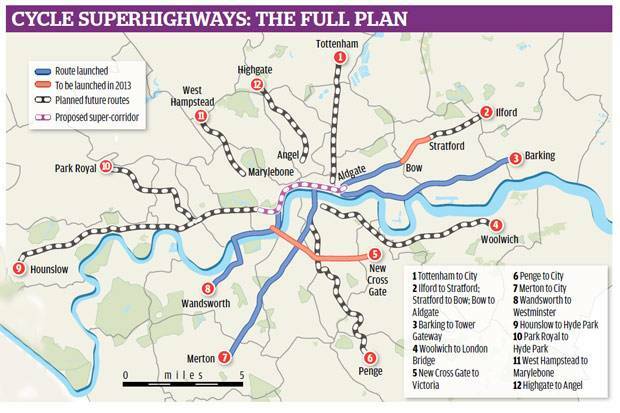 Will a "super-corridor" be better or worse than a Superhighway? I fear it will be be some kind of poor fudge. We'll see, as according to the Standard article, Boris is going to publish some sort of a "Cycling Vision" document this month, which will explain all. Following my commitment during the election campaign, I asked Transport for London to review the London Cycling Campaign’s Love London, Go Dutch to ascertain how the principles it establishes can be incorporated into the design and implementation of cycling schemes in London, taking into account the UK legal framework and regulations, the physical characteristics of London’s streets, and the needs of all road users. Those clauses: "taking into account the physical characteristics of London's streets and the needs of all road users" sound again like a cop-out. It sounds like nothing much will happen, because he has always used this language of "taking into account the needs of all road-users", from Day One of his administration. That language has always meant a reinforcement of the motor-dominated status quo in London, with cyclists being squeezed in grudgingly, with appalling road-user experience and declining safety. The "physical characteristics of London's streets" are, of course, just a red herring. They are much the same as the physical characteristics of the streets in any major world city. And even New York seems to be doing better for bikes now, not to mention the leading cycling cities of the world, like Tokyo, Amsterdam, Berlin, Munich and Copenhagen. Spending on cycling remains low relative to other modes and other parts of Europe. By allocating less than 1 per cent of its budget to cycling, TfL’s current business plan does not reflect the Mayor’s commitment to have a cycling revolution. The new TfL business plan should signal TfL’s intent to prioritise cycle safety in line with the Mayor’s objective to increase cycling modal share. TfL’s cycling budget has not been spent on the type of cycling facilities used in leading cycling cities that maximise safety for vulnerable road users. Unless this "Cycling Vision" document contains some quite stunning stuff, and TfL's next business plan, due in December, contains a commitment to a significant hike in the funding for cycling, in line with the Assembly recommendation, and we see in the next few months, certainly before May 2013, rapid, manifest progress towards implementing the "vision", I think LCC is going to have to declare that Boris has reneged on his Go Dutch promise: for its own credibility as an organisation. We'll see what political fall-out that has. We've had "visions" from Boris before, and this rhetoric is getting stale. Remember his "vision" of how "on these routes the bicycle will dominate and that will be clear to all others using them"? That was the Superficial Highways, £206 million wasted on blue paint between 2008 and 2013. We've had enough "visions" while the streets of London remain much the same, year after year, or even get worse and more dangerous for cycling. We need a practical plan based on international best practice. In other words, we need to Go Dutch. Meanwhile, meanwhile.... away from the glare of publicity of the junctions review, the Assembly investigation, the superhighways and super corridors and super whatever nonsense, apparently ignored by the Mayor and TfL, Camden Council, which pioneered Dutch-style cycle infrastructure in London a decade ago, quietly is bringing in plans to improve and extend its network. As reported on the Camden Cyclists site, Camden Council plans to implement one-way segregated cycle tracks in both directions along the entire length of Royal College Street, Camden Town. This will mean modifying the existing two-way cycle track between Georgiana Street and Crowndale Road on the west side of the road, making it northbound only, and adding a southbound track on the other side. I was initially skeptical that this would be a sensible expenditure of money, as the existing track was already one of the best facilities in London, if not the best, and seemed to work well. However, there had been a number of injuries to cyclists due to motorists emerging from the side roads, Pratt Street and Plender Street, failing to look in both directions for cyclists on the track (i.e. not seeing the contraflow southbound direction of cycling) and failing to give way. 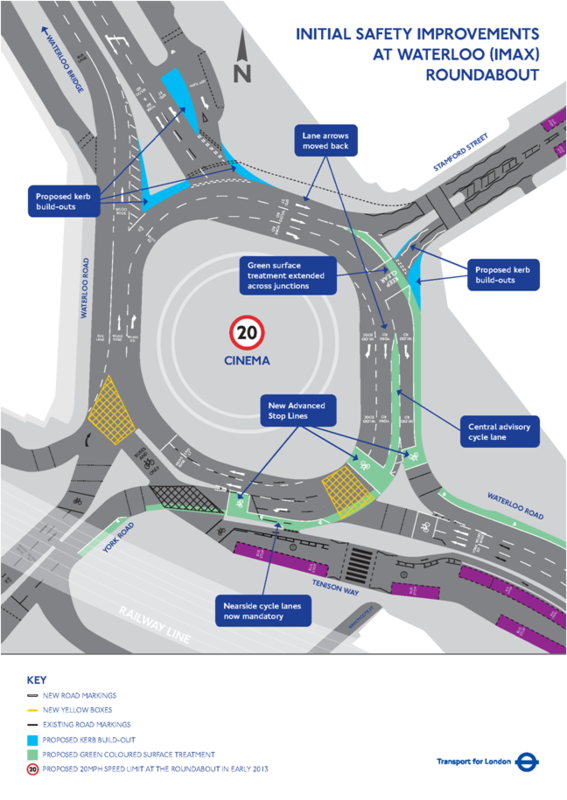 The protected route will be significantly lengthened as it will at last go from "somewhere to somewhere" (recalling Jon Snow's words on opening it in 2000 that it went from "somewhere to no-where"), running through the Camden Road junction up to the Kentish Town end of Royal College Street, where the road is two-way. So at last there will be a subjectively safe route all the way from Kentish Town to Euston Road. The proposals are at an early stage of consultation, and not all details are clear as yet. If you wish to put views on them, you can do so through Camden Cyclists. (Incidentally, I met the engineer of this scheme at the Love London, Go Dutch conference in October, and was impressed). The proposals will need approval from councillors. But it it great that at least in one London borough there does genuinely seem to be a willingness to concretely, permanently reallocate road space from motor vehicles to cyclists, and make it work technically. I guess it helps that TfL seems to have little involvement in this project. 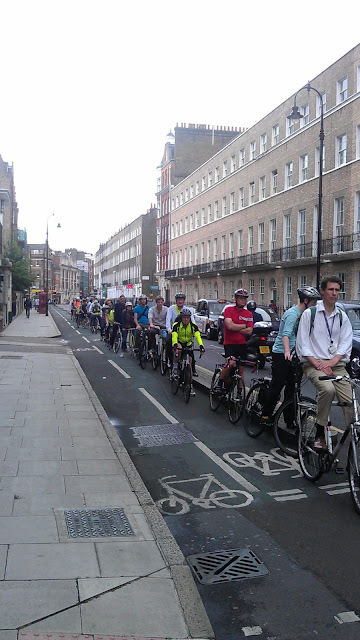 The big issue that Camden needs to address with its cycle tracks, however, is the absurdly congested Bloomsbury Route (Torrington Place, Tavistock Place etc.). This urgently needs to be re-implemented as it was originally designed by Camden Cyclists, at twice the current width, with one direction of motor traffic removed. Even better than doubling the width of the track of course would be to remove both directions of motor through-traffic and make the corridor into a "bicycle road", a true Cycle Superhighway. This is what has been done with the Weimarsraat route in the Hague, which was the original inspiration for the Bloomsbury or Seven Stations Link route a decade ago. 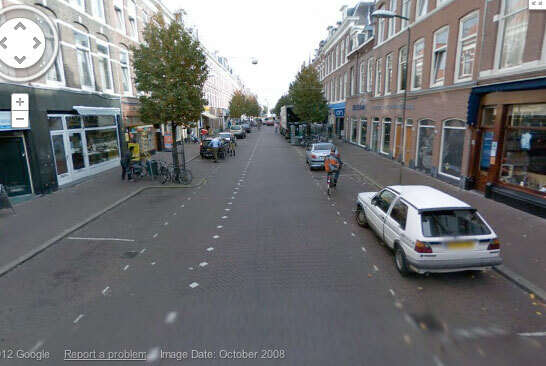 Weimarstraat had a two-way segregated cycle track then (wider than the Bloomsbury one), but today, in line with the Dutch practice of continual improvement on popular routes, the segregation is gone, and cyclists have the entire road. This has been made possible by the removal of the road from the through-route network for cars; cars can still gain access, as the Streetview image shows. I hear from Camden contacts that the Bloomsbury route may well be revisited in the forseeable future. I hope so. Ands I also hope for a Road to Damascus conversion from Westminster Council, to allow the route to be extended at similar quality through its streets all the way to Paddington, which was Camden Cyclists' original plan. We can but hope. We certainly need at least two east-west priority routes for bikes across central London, and this relatively northerly route would still be needed to complement the "super-corridor" along Embankment, even if that turned out to be really good. Taking into account the UK legal framework and regulations, the physical characteristics of London’s streets, and the needs of all road users. We need this quality rolled out on a much larger scale, and that will not happen without TfL driving it, and that will not happen without Boris Johnson doing far more. What would have to happen for mr Johnson to behave any different than he has done in the last halfyear? Going from somewhere to somewhere would be good. There are some really quite reasonable tracks near my home but they go from nowhere to nowhere. As to Boris, evidently you are not surprised by how things are turning out – I would challenge your marbles if you didn’t. Ever since I first thought about elections, when I became eligible for my first general election in February 1974, I really don’t think I have encountered a mainstream political figure as dishonest, mendacious and perfidious as Boris Johnson. True, he is closely challenged from both sides – Tony Blair and David Cameron (remember all that “hug a hoodie” guff, his sudden, temporary sympathy for the NHS which was “safe in [his] hands”, his “greenest government ever” bullsh*t?). My own assessment is that, bar some direct action, there is nil chance of Boris delivering on Go Dutch because he never had any intention of doing so, he just went along with it to tie down a few votes to secure a majority at the Mayoral election – a majority which was not exactly a landside as I recall. He probably got that advice not from his “f*ckwits” but from “Wizard of Oz” Lynton Crosbie (“we’re not in Kansas anymore, Toto”) who we now see moving across to perform his magic tricks for Dave. Let’s just hope that, like the story, Dorothy pulls aside the curtain to reveal who the wizard really is. I also suspect that the only type of direct action which would have any effect would be of the legal/judicial kind – some prosecutions for corporate manslaughter, or at least substantial civil damages claims by victims’ relatives – and for that you have to be an interested party (which thankfully so far I am not) and having deep pockets or a good assessment of your contingent fee position. However, we’ll probably have to make do with political direct action, led by the major cycling bodies in alliance with pedestrian groups to gain the greatest legitimacy. No more polite excuse-mes but flashrides, petitions, write-to-them campaigns, regularly and frequently. I know this is not a terribly helpful comparison – far more people identify with the pressures on them as motorists, especially those less affluent, often rural dwellers who need a car but are hard-pressed to afford one, than will currently identify with bicycle travellers – but you only have to look at the effect which car-parking “rights” campaigners can have on local authority decision-making. We have seen how a few wealthy self-interested restaurateurs etc can bring down perfectly sensible parking controls proposed by one of the least obviously car-hostile councils in Westminster when they get support from the wealthy editor of the local rag. A similarly toxic combination of (rather less wealthy) local chamber of commerce and the local rag has put Surrey CC to flight on plans for on-street parking charges or controls in my home town. The truth remains though that these lobbies achieved their goals despite being small minorities, and unrepresentative ones to boot, because they were exceptionally noisy. I know only too well that cycling is not a united front. LCC has travelled far, and CTC seems to be budging a bit too, vide recent Guardian comment by Chris Peck acknowledging that safety in numbers might not work, and Chris Juden’s comment on Alternative DfT’s blogpost. But surely there must be something which we can unite around. How about Boris’ obsession with Network Assurance? If you abandon that creed, surely all becomes possible (if not “affordable”) and could we not work out the detail later? As for Westminster’s Road to Damascus, we all hope for that but perhaps WCC makes a suitable second target alongside Boris? Nice to know that I can be proud to be a Camden gal. However rather than improving infrastructure that is already there (while it isn't perfect it's pretty good) I would prefer Camden add new facilities. I do use the Tavistock Place lanes and I agree - they are to narrow and very congested but I would personally love to see a dedicated cycle lane around the outer circle of regents park and all the way up parkway to Camden Town station. These are wide roads, some multi-lane where a bike lane could easily be added. Here's to some progress being better than no progress and fingers crossed for further improvements for cyclists to London's roads.